I dislike the practice of setting up separate funds for special purposes. The latest is the Merdeka Generation Fund. I do not know if separate funds were set up in the past for Edusave, Skills Future, Pioneer Generation, etc. Why do I object to this practice? A separate fund may give the impression that it is self controlling. It is no longer under the purview of parliament. This is one step towards lack of oversight and accountability. We have seen scams involving SkillsFuture. I do not know if there are other scams and malpractices with the other funds. I would not be surprised if they surface in the future. It is also bad to give different levels of benefits to different “generations”. We should treat all citizens equally. As more special purpose funds are set up, I ask the question – can we manage the complexity? Aiyah, pap is just having fun creating a lot of funds to fool the silly GE voters once again. As is known that Empty vessels make the most noise. For them it is even noises lah! VTO! Merdeka sgs are no beggars. Its their hard work n labour that so much RESERVES have been accumulated. Go do a historical accounting n check it out?! Just REMOVE G$T FOR ALREADY EXPENSIVE N PROFITEERING MEDICAL COST? FORGET THE FARKED UP PACKAGE,IT SEEMS MORE LIKE BAGGAGE! They should return the CPFund to us in FULL at 55 as originally agreed. There was a notice recently, said that you all will be very very rich by 2022. But details will be in 2021. That is after GE. You think chao papayas will fund all the various modules in the package? As usual, give you chicken wings then take back 1 whole chicken! 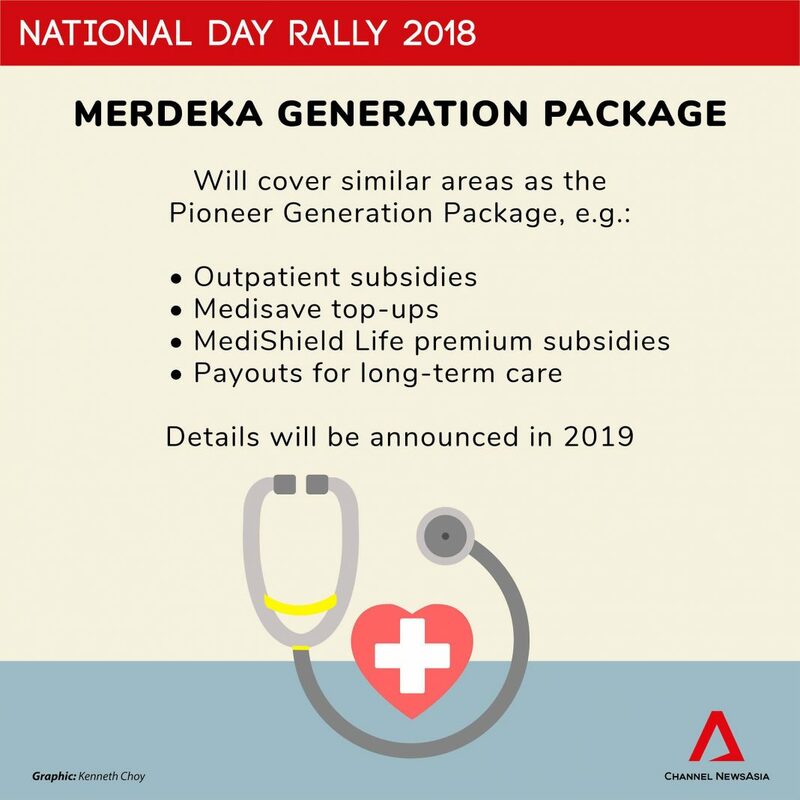 If the Merdeka Generation Package is the same as the Pioneer Generation Package, why call it differently? Just give it one name and every GE include another group of seniors in it, no need to think what to call! Just because PAP wants to buy votes, a different Package name sound like give a title to a selected group of atas people with special privilege, than what so special about the Pioneer Generation now. Is it because the PG already been conned once, no need to con them again? So the Merdeka Generation can now eat at restaurants, no need to Q in hawker centers or foods courts. And each PG will now receive a treadmill at home, so no need to exercise with trolley of cardboards! Whenever the G announces ‘gift’ packages…i worry alot. We should know this G by now. Im pretty sure its a Can See but Cannot Touch type of package..
Its all our own money anyway. Making Monkeys out of us or what? Separate funds makes it “easier” to “fix” things ! “Things” that needs to be “patched up” ! “Things” that previously “caused” and “burnt” a “BIG Hole” ! Go ask Holy Jinx,….she knows Best ! Precisely. Then they came up with this 65 to 70 thingyi we fought hearts & souls over the 65′s number, dont you think we are being deverted & played. How stupid we are. They dont call us daft for nothing. Conclusion, Sinkies are STUPID. If this GE, they lose 3 to 4 GRCs, then next GE maybe got Post-Merdeka fund. If they win big big this GE, then all hosay liao, GST double-confirm will raise to more than 9% and many taxes will be implemented to squeeze sillyzens dry dry. Response: think Mai Hum will have something SPECIAL for the PG also, promising that if the PAPIGS WIN BIG BIG this GE, all PG will receive a 50% discount from NTUC Fairprice Casket upon kicking the bucket! aiyoh. marketing lar. different periods need different wayang themes for ‘propaganda’ campaigns lar. so that every cohort will have to wait patiently (perhaps drooling like pavlov doggies lar) for their turn lar. next maybe independence generation, then next two-is-enough generation, then woody woodpecker generation, then pinky generation, on and on and on lar as long as the white monkey idiots are still in command. orelse, how would 151th media standard have enough bullet points to spin their wayang ? The only package we 55 yo and over are interested in, is our CPFund, in full. All those stupid ex-Malaysians also come here contribute to the 70% Foreigners also stupid come here get fleeced and short changed. Sinkies have been trained to echo the govt’s policies. Like all those coffee shop talk. Like broadcast robots.Those school students also stupid, don’t realise that their schools are making use of them to harass people. Some Schools have degenerated into some stupid brainwash mechanism. The idea of having little pots of money set apart from the consolidated fund is to ensure that Tumasek or GIC and “invest” it while large portions of the funds are not being used. They would have worked out how much is required each year or month and the rest, they simply put away for “investment” purposes. There is a whole lot of such little pots of funds hidden accounts of GLC and GRCs. VTO–the PAP–we can do better but start with a thorough stocktake of just what is actually in place rather than what we are told are in place.